Please note we are experiencing technical issues with payments at the moment. You can submit your application and submit the £400 security deposit payment now, however the £100 booking fee will be charged to you once you receive your GradPad portal log in details from the GradPad Team. 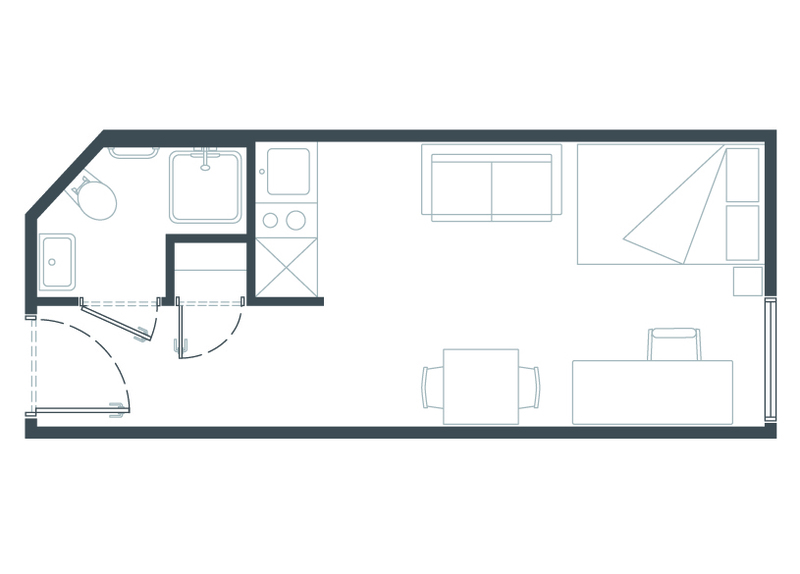 Our Standard Studios are cleverly designed to maximise space without compromising on any of the details. Each one includes a comfortable ¾ bed (190cm x 120cm), dining table and study area. Our Standard Gold Plus Studios are located on floors 8, 9 and 10 with excellent views over London. Please note we are experiencing technical issues with payments at the moment. You can submit your application and submit the £400 security deposit payment now, however the £100 booking fee will be charged to you once you receive your GradPad portal log in details from the GradPad Team. Our Standard Studios are cleverly designed to maximise space without compromising on any of the details. Each one includes a comfortable ¾ bed (190cm x 120cm), dining table and study area. Standard Gold Studios are located on floors 5, 6 and 7. Please note we are experiencing technical issues with payments at the moment. You can submit your application and submit the £400 security deposit payment now, however the £100 booking fee will be charged to you once you receive your GradPad portal log in details from the GradPad Team. 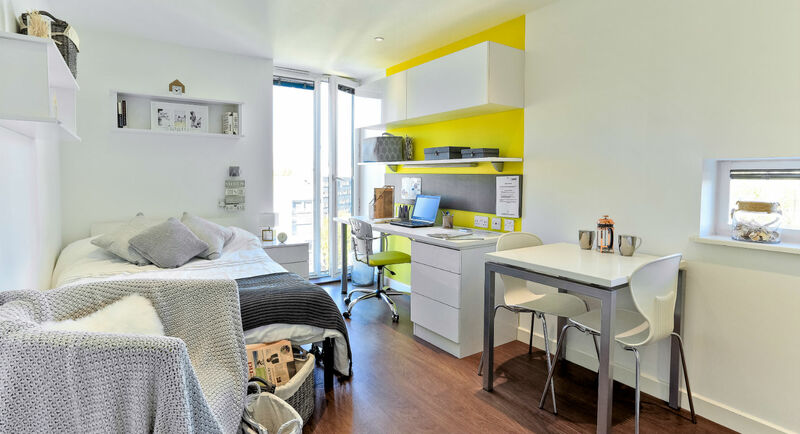 Our Standard Studios are cleverly designed to maximise space without compromising on any of the details. Each one includes a comfortable ¾ bed (190cm x 120cm), dining table and study area. Standard Silver Studios are located on floors 3 and 4. Please note we are experiencing technical issues with payments at the moment. You can submit your application and submit the £400 security deposit payment now, however the £100 booking fee will be charged to you once you receive your GradPad portal log in details from the GradPad Team. Our Standard Studios are cleverly designed to maximise space without compromising on any of the details. Each one includes a comfortable ¾ bed (190cm x 120cm), dining table and study area. Standard Bronze Studios are located on floors 1 and 2. Please note we are experiencing technical issues with payments at the moment. You can submit your application and submit the £400 security deposit payment now, however the £100 booking fee will be charged to you once you receive your GradPad portal log in details from the GradPad Team. 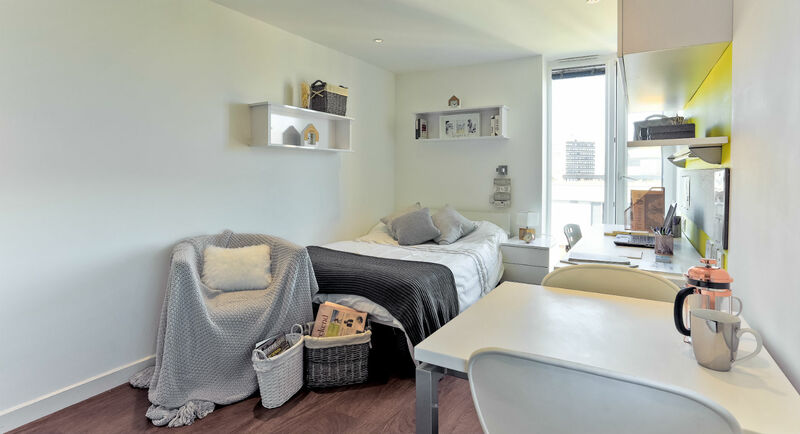 Our Standard Studios are cleverly designed to maximise space without compromising on any of the details. Each one includes a comfortable ¾ bed (190cm x 120cm), dining table and study area.